The Alexandra Suite was designed for the couple looking for a modern vintage wedding. This wedding invitation suite is an elegant style for the couple looking for a classic, timeless wedding invitation. You can customize this wedding invitation suite by changing the colors of the font, envelopes, and paper to fit your wedding vision. 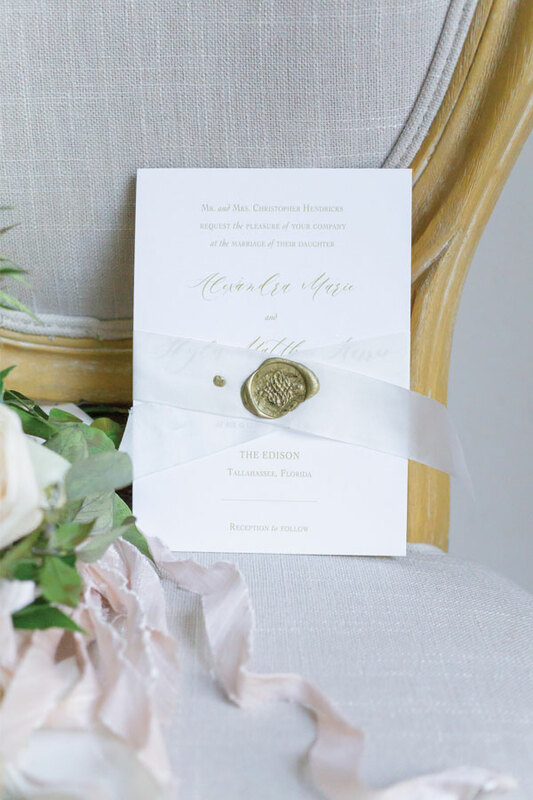 Pictured here, the Alexandra Wedding Invitation Suite has been customized with a silk ribbon, gold wax seal, champagne envelopes with a specialty envelope liner to give the vintage feel. You can also see the menu and place cards that have the same style with the silk ribbon added to each card.